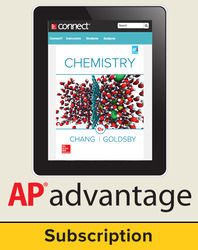 This bundle provides student access to the AP Advantage, including ONboard™, Connect®, and SCOREboard™, for 6 years. Raymond Chang received his B.Sc in chemistry from London University, and his Ph.D. in chemistry from Yale University. After doing postdoctoral research at Washington University and teaching for a year at Hunter College, he joined the Chemistry Department of Williams College. He wrote books on physical chemistry, industrial chemistry, and physical science. Kenneth Goldsby is a professor at the University of Florida, accompanies by Raymond from seventy edition USE of Fundamentals of General Chemistry. is studies on chimicainorganica have enriched the content and exercises in the book and his intense work with the students, both in the classroom and in the laboratory, has consolidated the long experience of the professor Chang focused on understanding and respect of the students point of view both the text and the teacher himself.